Elevator Antics is the twenty-fifth level of Donkey Kong Country. It is also the third level of the Kremkroc Industries, Inc. area. In the Game Boy Advance remake of the game, Elevator Antics is the twenty-sixth level, as well as the fourth area of Kremkroc Industries, Inc. (having switched places with Poison Pond). It is the only level to feature elevators. Taking place in a long cave, the heroes have to climb up and down ropes in this level, facing Slippas, Zingers, Mini-Neckies, and Oil Drums on the way. Throughout much of the level, the Kongs also have to navigate on and jump along small elevators filled with large amounts of coal to reach higher areas and cross abysses. Commonly in this level, they have to jump along each elevator to cross wide abysses and also avoid many Klumps along the way. This level, because of the elevators, is very similar to the third level of the Donkey Kong arcade game, which also features elevators as the main obstacle. 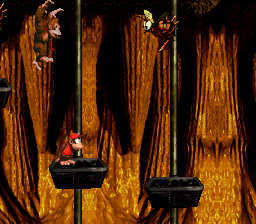 The Kongs climb under a ceiling near the beginning of the level. The level begins on a large ledge with a trail of bananas at the end of it that lead to a pathway holding a few Slippas and an egg-shooting Mini-Necky. The letter K can be found above the enemies along some ropes dangling from the ceiling. 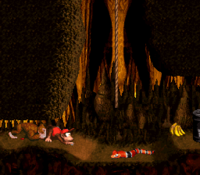 After the Kongs cross a small gap that follows a lone Slippa, the heroes can find another one of the snake enemies and two low ceilings that they must crawl under. A small area is between the two ceilings with a few Slippas in it, who have been spawned by an Oil Drum found against a wall after the second low ceiling. A Banana Bunch sits next to the drum near a rope that can be climbed to reach an area with a Mini-Necky in it. The primates can find a DK Barrel and an Oil Drum that releases Slippas ahead of here. A wide gap follows the drum, but it can be crossed with a trio of ropes that hang above it. A Zinger flies around one of the ropes. Three low ceilings are ahead of this abyss with a small space between each ceiling. The first space contains a single Zinger, but the second holds two Zingers and a trio of bananas. Once the heroes pass through this area, they can find an abyss that can be crossed with the use of a few ropes that have Zingers flying all around them. If they manage to reach the other side of the gap, they can find a low ceiling that they can crawl under to find a small area with a thin gap in it. A rope hangs down through the center of the gap to help the heroes lower themselves into a small area consisting of a DK Barrel and an Oil Drum that shoots out Slippas. A Zingers tries to get in the Kongs' way as they descend. Ahead of this gap, another low ceiling can be discovered with a large abyss right after it. Four ropes are within the pit the help the heroes cross, but a pair of Zingers get in their way as they travel along them. Two low ceilings that the duo must crawl under are on the other side of the abyss, and the small room between them contains a Slippa-shooting Oil Drum. A rope is located after the second ceiling that the heroes can climb to reach a higher area with a Mini-Necky and the level's Star Barrel. A ledge holding a Klump is near here with a large abyss after it. Two elevators carrying platforms full of coal are in the gap that the heroes can use to cross. A small platform holding a Banana Bunch is between the two elevators at the bottom of the abyss. Once this pit is crossed, the two friends can find a Steel Keg and straight pathway with a Mini-Necky flying over it. Another gap full of coal-carrying elevators is ahead of here. 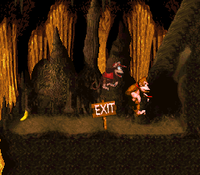 The first elevator can lead the primates down to a small ledge supporting the letter N. Once the abyss is crossed, they can reach an area of several stair-like structures that a few Klumps walk along. The heroes can find another wide abyss after a Steel Keg that stands on the edge of the platform. A Zinger in this abyss guards a single elevator that can help lift the Kongs onto a higher piece of land, where two Klumps can be found. If they drop down to a lower piece of land near here, they can find another abyss ahead of them with more elevators in it. Two stationary Zingers float at the bottom of the pit, which is followed by a solid pathway supporting Klumps. A DK Barrel that can free any missing Kong when opened wobbles above the pathway. Three elevators convey platforms in an abyss ahead of here, which is infested with Zingers. The pit is followed by a large area of solid ground with a Mini-Necky flying above it. The Kongs reach the end of the level. Another abyss is after the foe with a single elevator and a Zinger in it. On the opposite side of this pit, a sign indicating that the level is near complete stands with the letter G above it. A Mini-Necky shoots eggs at the Kongs to the right of it, where a deep gap can be found with an elevator carrying platforms all the way down it. The two friends can ride down on one of the platforms to reach a lower area with another elevator moving platforms upwards. Before falling into the abyss below, the heroes can jump onto one of these platforms to be raised into a higher part of the level, where a tall structure holding a Zinger stands between them and another elevator that pulls platforms downwards. The can jump over the structure and reach the platforms to be lowered back to the bottom of the area, where another Zinger and an elevator are present. Before being lowered into an abyss, they can hop over the Zinger and onto one of the platforms being pulled up by the elevator, which lifts them up to a ledge with a tire on it. The object can be used to bounce onto a higher area with a Mini-Necky and a small abyss containing another elevator. With the aid of the moving platforms on this device, they can cross the abyss and reach an area with the exit ahead of it, found after an exit sign. Animal Token of Expresso the Ostrich: In the "Find the Exit!" bonus room. Diddy Kong descends to the letter "N". K: A rope hangs above the first group of Slippas in the level that the Kongs can climb up to find a few other ropes with the letter K around them. O: The letter O is located in the second Bonus Level between two Barrel Cannons. N: If the primates ride down the first elevator in the second set of elevators from the Star Barrel, they can find the letter N on a small ledge. G: Near the end of the level before a Necky, the Kongs can find a sign indicating that the level is almost over. The level G hovers above it. At the very beginning of the level, the Kongs must make a super-jump to the right to reach a rope over the area. They should climb it up to reach an opening, leading to the Bonus Level. There, the Kongs need to hit four barrels so that the K-O-N-G Letters displayed on them all spell out "Kong," in the correct order. If this is done correctly, the heroes are awarded and then exit the special stage. If they fail to spell out the word, they are forced out of the stage without a prize. After crawling under three walls near the beginning of the level, the heroes enter an open area with a few ropes, all guarded by Zingers. The primates should avoid the foes and climb to the top of the last rope. There, they need to hop to the right to enter a hidden area at the top of the screen. If they continue east from here, they reach a Barrel Cannon that shoots them to a Bonus Level, where they have to shot through several spinning barrels to collect some special items, including the letter O, an Animal Token, and a green Extra Life Balloon. Once this is done, the Kongs can exit the bonus through an exit in the right side of the area. When the Kongs begin to go down the last elevator in the level, they have to stand on it and not jump to the ledge nearby. After they reach the bottom of the screen, they can discover an entryway. Walking into it will takes them to a Bonus Level. There, they need to shoot upwards through a barrel to collect many bananas. If they miss the barrel upon trying to land, the special level ends. DK descends into a low area. The heroes standing on a ledge near an elevator. Diddy jumps from one elevator to another. In the Japanese version of the game, an extra DK Barrel was added at the top of the vine that leads to the first Bonus Room. This page was last edited on April 9, 2019, at 18:37.